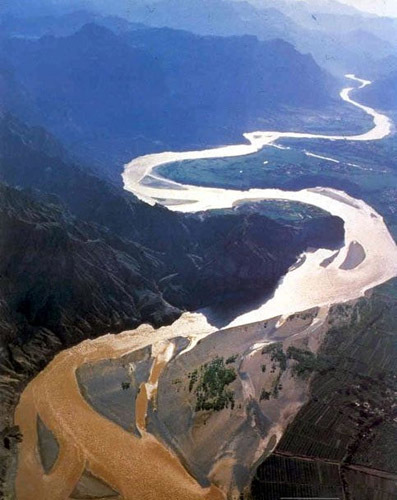 The Yellow River is the second-longest river in China after the Yangtze and the sixth-longest in the world at the estimated length of 5,464 kilometers. Originating in the Bayan Har Mountains in Qinghai Province in western China, it flows through nine provinces of China and empties into the Bohai Sea in the east. The Yellow River basin was the birthplace of ancient Chinese civilization and the most prosperous region in early Chinese history, earning the name as "the Mother River" and "the cradle of the Chinese civilization." Since ancient times, Ningxia Hui Autonomous Region has been famed as an oasis in the loess highland blessed by the Yellow River, which runs across nearly 400 kilometers in the region and supplies 4 billion cubic meters of water annually for irrigation, forming typical Yellow River culture in the autonomous region. In 2009, the Ningxia government proposed the idea of building a Yellow River-front economic zone and developing 10 cities and counties along the River in the region. The economic zone is designed to include levees that can hold the Yellow River, convenient public transport networks, industrial parks, featured cities and towns, ecological landscape beside the 400-kilometer highways along the River and cultural attractions at the two banks of the River. Landmark cultural buildings such as museums, libraries and gymnasiums have been built in the 10 cities and counties along the Yellow River. The newly-developed Yellow River-themed attractions, including the Yellow River Altar, the Yellow River Tower, the Yellow River Ancient Town, and the Yellow River Canyon in Qingtongxia, have also been open to the public.